Except for slug and vole feasts, hostas are generally considered disease and insect free. However over the last few years we are getting more than just slug complaints. Hosta problems may be showing up now. Hosta Virus X (HVX) was first reported in 1996. Beginning last year, it began to be reported more and more frequently in nurseries and "big box" stores. The virus causes mottling, stunting, twisting and/or puckering of the leaves. Last year, it became a widespread problem on hostas imported from Holland and grown in the U.S. This year, reports of the virus are reaching epidemic proportions. The MSU Landscape Alert reports that inspectors from the Michigan Department of Agriculture found HVX in record high numbers in that state this spring. There is no treatment available; infected plants must be carefully isolated and destroyed. The virus is spread by contact of the sap of an infected plant. It can be spread by lawn mowers, string trimmers and touching or stepping on infected plants. It can be spread from the leaves or rhizomes during cutting. 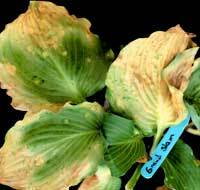 The Hosta Library maintains information about HVX and images of infected plants. The American Hosta Society (AHS) says mottled-leaved hostas should be assumed to be infected with a virus and, even if tested negative, they should always carry that suspicion. According to AHS, plants that exhibit virus characteristics should be destroyed. The Hosta Library's Spring 2005 HVX Update lists cultivars that have been found to be infected with HVX. "Because this virus can take 3 years or more to show symptoms, some infected plants are turning up in gardens in hostas that were thought to be healthy," reports the Hosta Library. "Hostas in all types of nurseries and garden centers can frequently be found exhibiting symptoms that are typical of HVX. These locations include everything from the big box stores like Home Depot, Lowes and Wal-mart, to finer plant nurseries, hosta specialty nurseries and smaller local garden centers. The virus is most commonly found in the cheaper varieties that have been mass-produced in very large numbers." This virus is transmitted primarily through cutting the plants. Contact of the infected plant's sap with sap of a healthy plant will infect the new plant. This can happen whenever cuts are made and the instruments or hands are not disinfected afterwards. Dividing hostas, removing spent blooms, removing leaves, stepping on them, even accidentally running the lawnmower over them can and will spread this virus. The virus survives only in living plant tissue and dies without a host. Plants in pots may be simply disposed of or burned. Plants in the ground should be dug carefully as to get as many roots as possible, and the spot should not be replanted until any remaining roots have died and rotted away.